Home Geek News The 3rd Annual Club Fantasci Christmas Game Drive! Hello! It’s that time of year again when we raise money and games to help those in need at Christmas this year in the Nashville area! We are firm believers that everything you do should be to the benefit of others and because of that,the last two Club Fantasci Christmas Game Drives have raised over 1,800 games valued at over $40,000! How amazing is that? We were able to help so many different causes of which you can read more about and view the videos below. The need for games ranges from young children to teens. We need games of all types because certain charities like Community Options serves adults with mental disabilities and Cedar Grove also uses role-playing games to work with their teens on their social issues. Books, Comics, Toys, collectibles or accessories make great gifts as well! 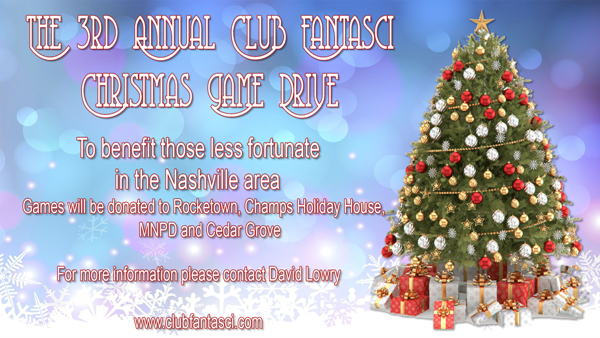 We have been so amazed at the awesome response the last two years so let’s keep up the the spirit this year with the 3rd Annual Club Fantasci Christmas Game Drive! There are so many disenfranchised children, families without work, people with disabilities or with no hope for Christmas this year. Let’s change that and put a smile on the faces of those who have so little. Let’s step up and show everyone what we are capable of when we band together! A massive, massive thank you to all the publishers who donated so many games last year! We hope we can surpass that amazing generosity this year! Thank you to everyone for your support! We love you so much!